I know my last post was about how I've gone all low-fat but ya know what? I got my period today and I also received a box of amazing goodies from Prana Organics, which included a jar of magical hazelnut butter. So I am marrying the jar of hazelnut butter today and my 80/10/10 ways can wait til my period is over. I need to continue talking about this hazelnut butter because you do not yet fully understand the magnitude of deliciousness that it is. My life changed when I dipped my spoon into the jar an hour ago, and it changed for the better. Imagine Nutella... then imagine it being approximately 1326 times yummier... then imagine it's healthy... then you realize that what you are imagining is Prana's organic hazelnut butter, and the only ingredients ARE HAZELNUTS. For real, guys. It's better than Nutella and it doesn't even contain chocolate or sugar. That is why I called it magical a moment ago. Normally I say any organic, ethical brand is a great choice for food, but I have to say that I cannot imagine any hazelnut butter tasting better than Prana's. Also, the texture is heavenly. It's like chocolate sauce. UGH IT'S TOO GOOD PLEASE GO GET SOME NOW. You can buy their wonderful treats foods here. Moving on. To my period. (I promise I will eventually connect this all to the recipe). I have to celebrate my feminine fertility whenever this time of the month rolls around, because it's pretty freaking awesome that us ladies have a human-making system in our uterus', and when I research menstruation (yeah... I do that), I just get really excited and intrigued about what is going on in my body. Having said that, it doesn't change the fact that for 5-7 days every month I basically just roll around moaning and crying for no reason like a depressed bipolar beached whale... plus blood. But at least the weather is nice so I can groan and lay around in the sunshine, and I've got a sweet boyfriend who's gonna massage my bod later tonight. Until then I will just have to keep trying to do it myself... and keep failing. Have you ever attempted to give yourself a back massage? There's a reason humans are social animals: IT'S ALL FOR THE BODY RUBS, GUYS. So I'm in whiny hormonal hopeless whale mode today and all I want is copious amounts of vegan mac and cheese - it's happening tonight, I am so glad I was smart enough to buy an organic butternut squash the other day - and more of that incredible, better-than-Nutella magic. Therefore I created a milkshake that is essentially just diluted Nutella. Obviously I love you so I made it healthy. Let's drink. Blend it all up, adding as much or as little liquid as you want. Uggghhh yessss. Yum! Nutella milkshake looks tasty and nutritious. I think you keep the banana producers in business! Haha! 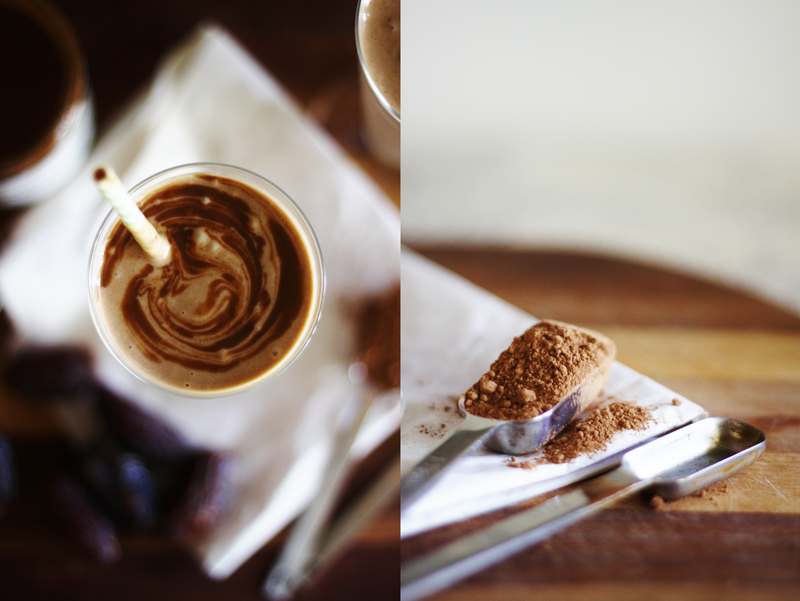 I make nutella milkshakes all the time, but a healthier option sounds amazing! Thankyou for everything you Share, much moré than recipes :). Brilliant; I'll be needing some of that in a few days! I do find home made butters beat anything you can buy in a jar though- maybe because of the freshness that you can't get from bought food? Hazelnut butter makes any chocolate-y thing 10 times more decadent and this doesn't look like an exception! YES! Haha, you always make me laugh. But seriously, thanks for talking about periods on your blog. People always act as if it's a disgusting thing that should be hidden but I say TALK ABOUT IT and if it makes the boys cringe, well at least that's my entertainment for the day sorted. That hazelnut butter looks so runny!! I've bought some before and made my own but it's never this runny. Haha yeah that reminds me of a few months ago when i had gotten raw almond puree for Christmas, and even though i was trying to eat low-fat i could NOT resist the heavenly taste of the frickin almond puree, and it was gone within two weeks. did i mention, it was a HUGE 2 pound bucket o_o i could just spoon it away like that... it was just soo good! :D well, i guess once in a while a little healthy fat is good for you, right? i usually eat low-fat though. only carrots and kale and other fat-soluble vitamins i consume with some fat like nuts, shredded coconut or avocado. Bummer! They only ship to Canada. I've used Gem butter which is so so delicious but has added sugar. Was hoping to try this with NO sugar. This looks so good! I loved Nutella as a vegetarian, and I miss that taste- this looks like it will be delicious! Thanks! How many servings is this, because as it is made, it has 107 grams of sugar in the recipe--whole foods or not, that's a lot of sugar for those of us who can't do sugar well. This sounds yummy. Thanks for posting up this recipe.